Wanderers’ Jordy Shaw (blue) eludes the tackle of All White Tim Payne in the main game. Photo: Grant Stantiall. The winter season may have finished but Cambridge football fans have plenty of action to watch as summer nears. 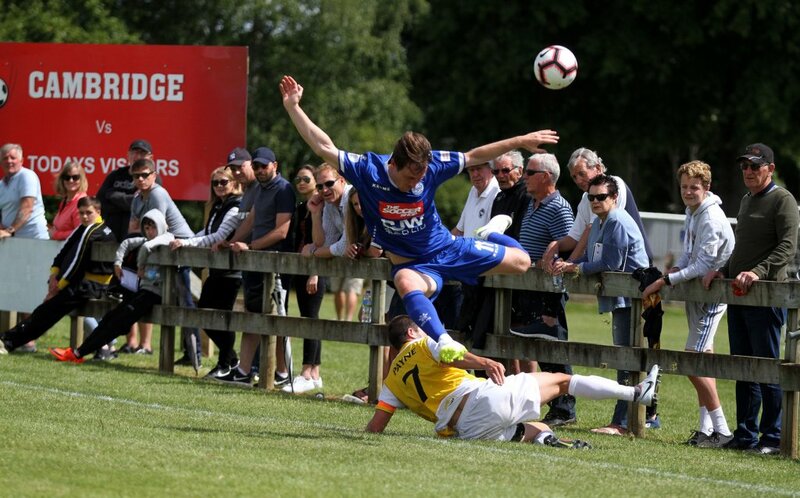 About 400 spectators saw a national league double header at John Kerkhof Park last Sunday when Hamilton Wanderers lost 2-0 to Auckland’s Eastern Suburbs in the main game. In the early match, Wanderers beat Suburbs 5-1 in the National Youth League fixture. The day before, Cambridge FC hosted two rep games between U-14 and U-16 girls teams representing Waikato/Bay of Plenty and Auckland. And at St Peter’s Cambridge, four teams from the Ricki Herbert Football Academy played in matches between Auckland-based players and those representing the rest of the North Island. Meanwhile, more than 300 players are taking part in the midweek Onyx Cambridge Summer League, a 5-a-side competition for men, women and young adults which runs till February. This Sunday December 2, Waikato U-13 boys will play Bay of Plenty at John Kerkhof Park.